Carol Stream Park District Fountain View Recreation Center’s Indoor Pool is located at 910 N. Gary Ave, Carol Stream. It consists of a 25-yard, 8-lane lap pool and a therapy pool. Two lap lanes are designated to lap swim during regular operating hours. Swim lessons and swim team practices are in the 25-yard lap pool. The Dolphins Swim Team also host all of their home swim meets at the Fountain View Recreation Center. Bring your family to Fountain View for fun in the water during designated open swim hours or purchase a lap swim membership. Only all-inclusive fitness center members have access to towel service and can request a towel at the fitness center front desk, 2nd floor. Lap Swim members should bring own, personal towel. 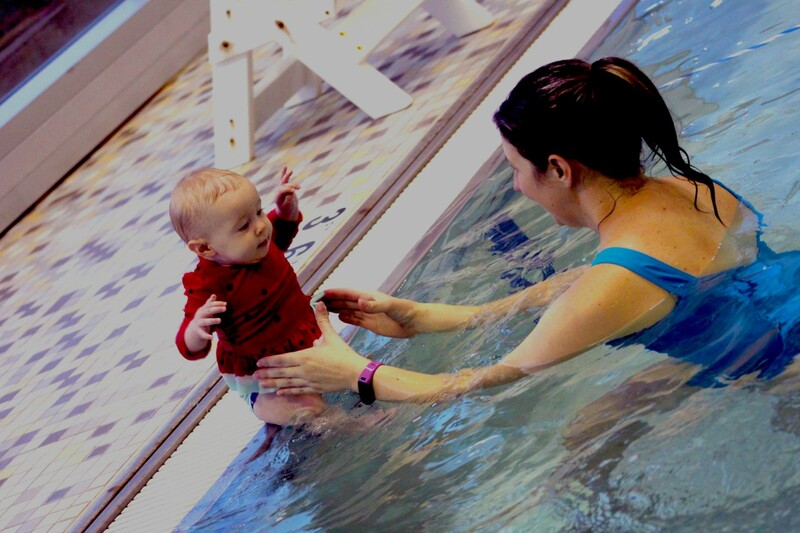 The Carol Stream Park District’s Swim Academy has a variety of swim lessons for all ages, starting at 6 months old through teens and adults. Swimmers are evaluated for swim level placement, and lessons are conducted in either the 25-yard lap pool or therapy pool depending on swimmer level. Customize a lesson to suit your schedule or get one-on-one private lessons. Excel to the award-winning Dolphins Swim Team! Learn basic skills of how to swim or improve your swim stroke. Gain confidence in the water and perfect your stroke technique. Beginner and Stroke Refinement classes available. Get a more personalized approach with our private swim lessons. One-on-one lessons are tailored to meet a swimmer’s needs. Lessons are 30 minutes in length for a series of six lessons. Want a private swim lesson but none of our scheduled times work for you? Contact our Swim Lessons Coordinators to schedule a custom private lesson. Participants receive a total of three hours of instruction. Lessons cannot be scheduled during swim team practices, group lessons or regularly scheduled private lessons. Additional in-house family members may be added on for an additional fee with a maximum of three students per class. Contact: 630-784-6187. The Carol Stream Park District Dolphins Swim Team has been an important part of the Carol Stream community for well over 20 years! The Dolphins encourage participation in the sport of swimming while teaching proper swimming techniques. A volunteer-based program for youth who want to join the world of competitive swimming, the Dolphins compete in the Northern Illinois Swim Conference along with 14 other park district teams. During the winter season, competition is from October through mid March. Dolphins compete in the DuPage Swim & Dive Conference along with 12 other park district teams during the Summer season; competition is from mid May through July. The team is split up into two practice groups based on swimming ability. Blue Team swimmers must have a minimum of two years prior competitive swim experience or approval from the Head Coach to join the Blue Team. White Team swimmers are new to competitive swimming or have less than two years of competitive experience. All swimmers are invited to participate in dual meets. Participation in Championship Meets will be determined by times at the end of the dual meet season. Participants must be able to swim a minimum of 25 yards without stopping to compete in a swim meet. Although the swim team is a Carol Stream Park District program, the team is run in large part through the help of parent volunteers. Parents are required to volunteer at swim meets. Parent volunteers are the only way to help keep the costs of the swim team as minimal as possible. The Dolphins appreciate all of their dedicated volunteers! Includes access to 2 lap lanes only during regular operating hours-this membership does not include access to any other areas of both pools or aquatics classes. Access to kickboards and buoys. * Per person, must live at same address (ages 12+ only). ** Lap Swim Membership – Access to 2 lap lanes only during operating hours – membership does not include access to any other areas of both pools or aquatic classes- Access to kickboards and buoys only. Bring your family to Fountain View for fun in the water during designated open swim hours. * Ages 2 yrs and under are Free. Visit csparks.org for holiday hours. Get fit in the water with our wide range of low-impact aqua fitness classes held in our therapy pool and in the 25-yard lap pool. Our aqua classes are easy on your joints, yet challenging enough to help you reach new levels of fitness. Because of the low-impact format, aqua classes are suitable for every age and fitness level, from beginning exercisers to elite athletes. 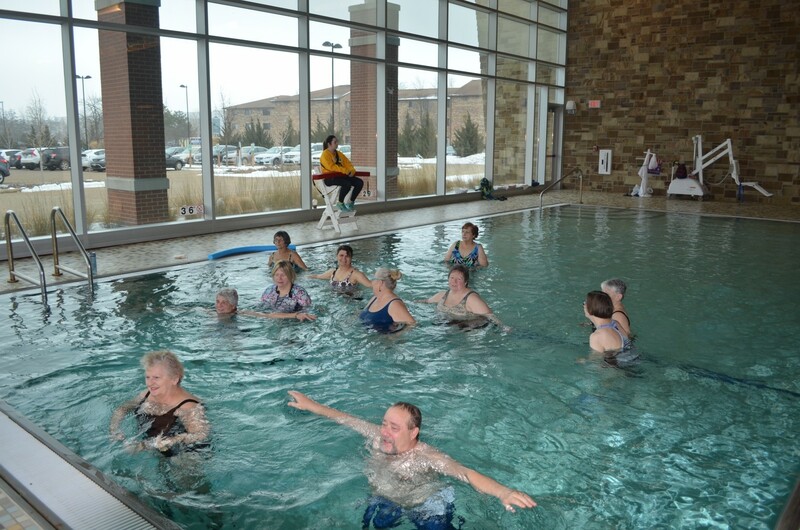 Try our therapy pool, where an instructor guides you through a series of exercises that help increase range of motion in your joints and strengthen muscles weakened by arthritis. "95 percent of Americans overall think it is important for children to learn to swim at an early age"
More than nine in 10 Americans (95 percent) believe it is important for children to learn how to swim at an early age. Drowning is the number one cause of unintentional death among children ages one to four. The Carol Stream Park District, along with park districts nationwide, refer to the National Recreation and Park Association (NRPA) for industry articles, information, research and more. We would like to share this article and research from the NRPA. Each month, through a poll of Americans that is focused on park and recreation issues, NRPA Park Pulse helps tell the park and recreation story. Questions span from the serious to the more lighthearted. In this month’s poll we asked the public, how important is it for children to learn how to swim at an early age. More than 9 in 10 Americans (95 percent) believe it is important for children to learn how to swim at an early age. Parks and recreation is a leading provider of low-cost swimming lessons. Nearly 70 percent of agencies nationwide provide aquatics programming, including learn-to-swim lessons and water safety programs for children and adults. Research shows risk of drowning can be reduced by 88 percent if children participate in formal swimming lessons between ages 1–4. Swimming is a vital life-saving skill that every child should learn.